Do girls need special attention when it comes to science, math, and technology topics? In response to last week's article about Techbridge, the after-school science program specifically geared to girls, some readers strongly refuted the notion that girls need the extra nudge. "'Steering' something suggests directing it in a path it would not normally, of its own inclination, go!" wrote reader Julian Penrod. "The very title connotes a program to give an impression of female overall interest in the hard sciences, even though it wouldn't necessarily, on its own, exist. In other words, a fraud." The reader raises a subtle but important issue -- but it goes much deeper than that. According to Claude Steele, author of Whistling Vivaldi and Other Clues to How Stereotypes Affect Us, it's not that girls aren't necessarily interested in science and math, it's whether they're discouraged from following their interests because of the persistent stereotype that girls aren't good at that sort of thing. "The idea of the 'gift-that-girls-don’t-have' is likely to be a key part of what’s keeping them from pursuing those careers." Steele has examined this very phenomenon closely for years and has identified it as a stereotype threat. The issue is much more complex than the very basic tendencies of what naturally interests either gender. Steele pinpoints the problem to what happens after girls follow their interests in science and math studies, when inevitable obstacles come up. "When you perform in science and math... in the larger society you're stereotyped as not being good at it," Steele says of girls. "You experience a little frustration, you say, 'Am I confirming that stereotype and am I going to be seen to confirm that stereotype? Am I going to have to live under this pressure for the rest of my life if I choose this as a career?' So there's a pressure coming just from those stereotypes that discourages women from engaging in those fields and, and staying in those fields even when their skills and abilities are A-plus. So that's an extra burden." Steele says it's a subtle but crucial mindset that can make the difference between a girl choosing to go into a STEM field -- or trying harder on a math or science test -- and choosing not to. Stanford researcher Carol Dweck, who wrote Is Math a Gift? Beliefs That Put Females at Risk, takes it one step further. Dweck has researched the topic of stereotypes, natural aptitude, and how praising effort or intelligence can be harmful, and she's come up with a thought-provoking conclusion. "One of the most damaging aspects of the 'gift' mentality is that it makes us think we can know in advance who has the gift. This, I believe, is what makes us try to identify groups who have it and groups who don’t—as in 'boys have it and girls don’t,'" Dweck writes. "Can anyone say for sure that there isn’t some gift that makes males better at math and science? What we can say is that many females have all the ability they need for successful careers in math-related and scientific fields and that the idea of the 'gift-that-girls-don’t-have' is likely to be a key part of what’s keeping them from pursuing those careers." Rodolfo Mendoza-Denton, associate professor of psychology at UC Berkeley, has also researched the phenomenon and says these detrimental stereotypes are enmeshed in our culture. “It’s pervasive in our cultural narrative,” he said at the Innovative Learning Conference. “‘I’m not this kind of learner or that kind of learner. I’m good at words, but not math.’... It’s a theory about how the world works." Societies without these stereotypes don't impose the same burden, Steele says, and as a result, there are a great deal more women engaging in science and math-based fields. "Poland, India, parts of Asia, where there are many more women participating in math and STEM fields, the stereotype is much weaker. The girls going into those fields don't experience the same pressure they do in a society like ours where relatively few women participate in these fields. That strengthens the stereotype and the pressure they can feel." Where do these stereotypes come from? Cues from the environment that suggest there aren't many women in this field, Steele says. In short, a self-fulfilling prophecy. "The pictures on the wall don't show many women as famous mathematicians," Steele says. 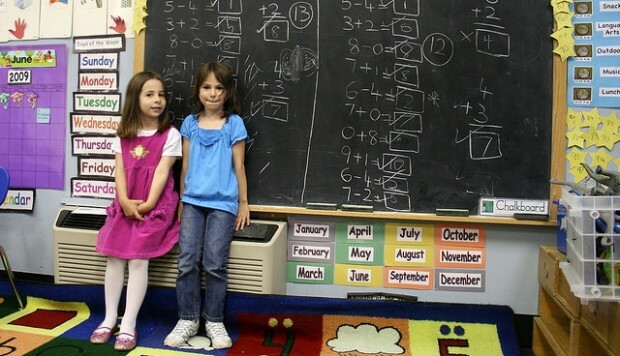 "Examples used in math classes are more boy-oriented than girl-oriented." It all comes down to our understanding (and thus, kids' understanding) that it's not about a fixed set of abilities, but about what can be learned. Dweck observed in her study that, by the end of eighth grade, "there is a considerable gap between females and males in their math grades— but only for those students who believed that intellectual skills are a gift. When we look at students who believed that intellectual ability could be expanded, the gap is almost gone." If we as a society understand that ability is expandable and incrementable, and subject to deliberate practice, the impact of being stereotyped can be dramatically reduced, Steele adds. Schools should practice this strategy, and parents should create an atmosphere at home that learning math and science can be as challenging for girls as for boys -- and that the fun lives in solving the challenge. At Techbridge, the after-school science and math program for girls, founder Linda Kekellis says the exposure to women role models has gone a long way in making careers in STEM fields a real possibility for students. She says more than 95 percent of girls believe engineering is a good career choice for women. "We've tracked back to some of our girls who have graduated from Techbridge and have found that a large percentage of them are studying science and engineering in college and are planning to have careers in those fields," she says.